Building on its long-standing relationship with Dassault, Honeywell Aerospace is supplying its advanced Primus Epic cockpit technologies to Dassault’s newly unveiled Falcon 5X. Primus Epic’s latest enhanced features have been customised for Dassault’s EASy III cockpit. The new plane combines safety, performance and new capabilities while achieving the lowest fuel consumption in its category. 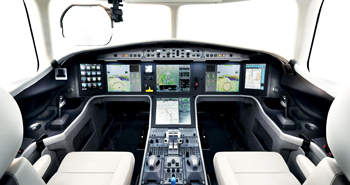 “Dassault wanted to create one of the most advanced and comfortable business jets available without compromising fuel economy, and Honeywell was at the centre of that with our advanced, digital cockpit technologies,” said Brian Sill, president, business and general aviation, Honeywell Aerospace. • SmartView Synthetic Vision System: SmartView significantly improves the flight crew’s view outside the plane. It provides a large, 3-D colour synthetic image of the outside world when pilots can’t see due to weather or other conditions, enhancing safety and efficiency. • Next Generation Flight Management System (NGFMS): This system has been completely redesigned to prepare for future navigation and safety requirements. Pilots can examine fuel burn predictions on multiple flight plans and easily switch to the optimum route. The NGFMS most notably will support the time- and fuel-saving approach procedures known as Required Navigation Performance Authorisation Required, which allows a plane to fly a specific path to the runway while avoiding obstacles such as mountains. • Graphical Datalink: This feature enables pilots to manage air traffic control communications with a point-and-click cursor rather than traditional text-based tabbing and typing. • IntuVue RDR-4000 Weather Radar: IntuVue enhances safety with automated 3-D scanning, allowing pilots to make safer and more informed route decisions sooner and avoid hazardous weather. • SmartTraffic TPA-100C TCAS: SmartTraffic is designed to incorporate Automatic Dependent Surveillance-Broadcast In for enhanced display of surrounding traffic in the air and on the ground. • Integrated Navigation (INAV): Honeywell’s INAV merges navigation and sensor data onto a single multilayer, high-resolution display so the pilot can efficiently monitor traffic, weather, terrain and geographic location without constantly switching views.